There's something about the month of July that automatically brings patriotism into our hearts! 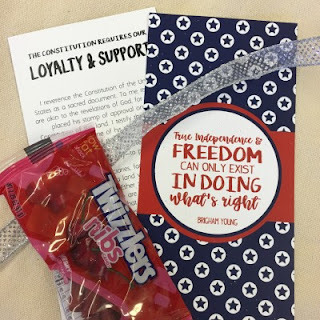 We absolutely fell in love with this quote from Brigham Young (which is featured on the front of our gift this month): "True independence & freedom can only exist in doing what's right." How awesome is that? We also include an amazing short talk from President Ezra Taft Benson about the importance of being loyal and supporting the constitution of the United States of America. A copy of his talk, as well as a package of Twizzlers or Nibs (something to munch on while you read!) is all wrapped up in a cellophane bag, tied with a sparkling ribbon - ready to give to anyone you'd like!